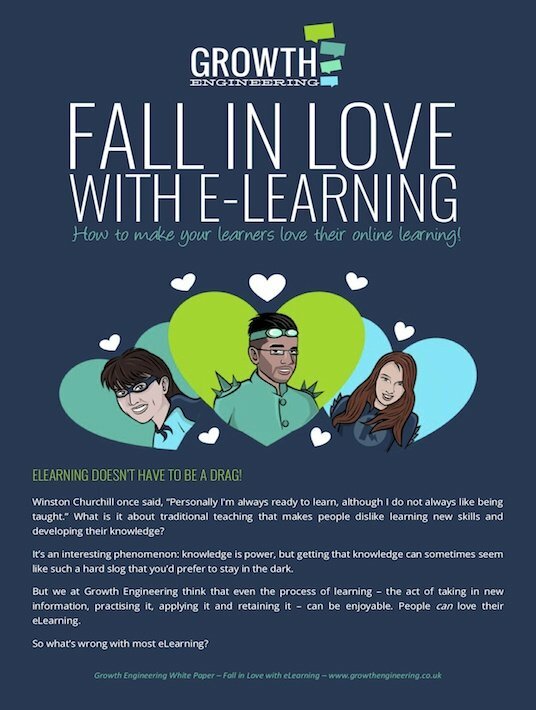 Free eBooks / Fall In Love With eLearning: How To Make Your Learners Love Their Online Learning! When learners love their eLearning they are motivated, engaged, eager to learn, and happy to commit to learning. This free eBook will help your learners be more productive, share knowledge, learn more and become more successful, saving the company money. eLearning Doesn't Have To Be a Drag! We’ve said it before and we’ll say it again: students can and should love their learning. eLearning doesn’t have to be boring! If someone says they hate school (or university, or work training courses, or eLearning), they don’t mean they hate learning. How To Get People Loving eLearning – Theories! Bloom’s Taxonomy explains that there are different levels of learning, from in-depth ‘creating’ learning tasks, down to more basic ‘knowledge’-based approaches. How To Get People Loving eLearning – Gamification! Moving on from theories, let’s look at some features that can make people fall head-over-heels in love with their learning. How To Get People Loving eLearning – Personalisation! hierarchy we saw earlier: make the learning personalised! How To Get People Loving eLearning – Clear pathways! We know how important a clear pathway is, so we developed Game Changer – it’s a gamification feature that not only adds an element of teamwork and fun to the learning, but keeps everyone on track. When Learners Love Their eLearning – The perfect scenario! In Europe, around 75% of companies are training their staff using online courses. eLearning saves money, provides a better ROI, has fantastic rates of success and, if done correctly, really engages learners and encourages behaviour change. While the ‘e’ in eLearning doesn’t stand for exciting, or engaging, it is in your hands to make it so. If this task is something of great difficulty in your mind, then you should spend some time with this edition by Growth Engineering. There are more than one ways to make your learners fall in love with eLearning. Read them and choose, one or all.